What does a cheap hotel smell like? These days, it may be notes of jasmine mixed with wood and honeysuckle. Luxury hotels have scented lobbies, hallways and other public spaces with carefully crafted perfumes for several years to create a memorable brand image and stealthily calm guests as they arrive. Now budget chains are spritzing, too. Hotels have arguably never paid so much attention to how they smell, employing expert “noses” from leading perfume makers to entice travelers with just the right amount of sandalwood. Marriott International and InterContinental Hotels Group use scent in most of their brands, from Best Western on up. The hip W sprays a floral scent with notes of jasmine and sandalwood. The Westin chain promotes wellness, so it employs a white tea aroma that is calming, says Tina Edmundson, global brand officer for Marriott. “If you put the W scent in a Westin environment, it would feel odd. It would feel out of place,” Ms. Edmundson says. Moxy Hotels, Marriott’s newest budget brand targeted at younger travelers, has a scent to enhance the notion of fun experiences. The most important corporate rule guiding Moxy’s olfactory profile: It can’t smell expensive like a Ritz Carlton. ScentAir, a Charlotte, N.C., company that develops and delivers scents for hotels and other industries, says its highest area of growth right now is in value hotels. Hotels say the scent has to fit the brand, and mixing the right fragrance is crucial to marketing. Experts say what we smell and hear can create lasting impressions stronger than visual cues. Just as favorite songs get attached to memories, so, too, can pleasing smells link a certain brand or place with happy thoughts. It’s not that consumers are going to book Sofitel hotels for the smell. Price, location and service are still bigger drivers of repeat business, Mr. Rocco says. But when you get to a Sofitel hotel, you’ll feel more comfortable because the smell is familiar, he says. “It gives you a sense of arrival, a sense of familiarity. It really helps get transition from the outside,” Mr. Rocco says. Westin was one of the first with a chain-wide white tea scent it began testing in 2005. 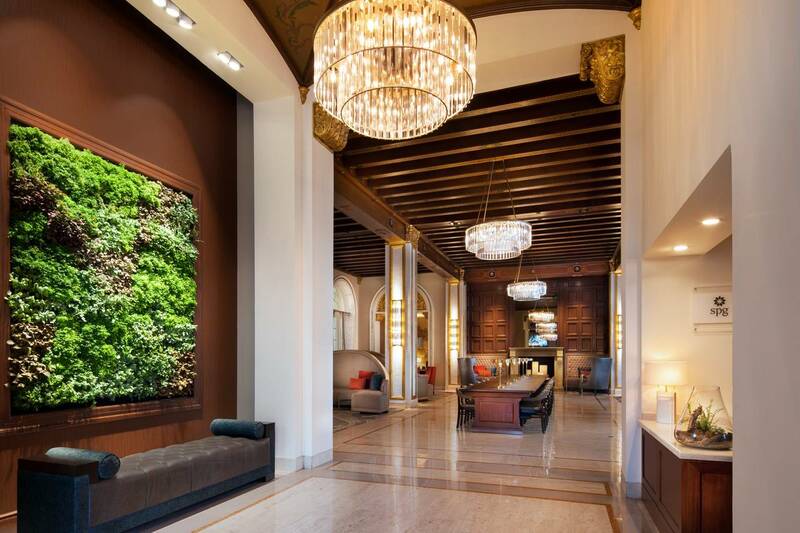 Westin has stuck with the same scent, but many brands are updating and shifting. Sofitel shifted its strategy last year from having off-the-shelf scents selected by local staff to a unique Sofitel scent common to all properties. The regional strategy, launched in 2009, had worked, Mr. Rocco says–people bought candles. “But we were missing an opportunity to really build a very unified marker for the brand,” he says. Sofitel now uses Essence de Sofitel, a fragrance developed by famous French “nose” Lucien Ferrero. It’s a mix of lemon leaf, bergamot and basil, supported by lily of the valley, white rose and cardamom, with a complex bottom note of precious woods like white sandalwood. The scent is diffused in the lobby of Sofitel’s 120 hotels and sometimes sprayed in corridors and elevator areas by housekeeping. A few people do turn up their noses at scented hotels. MGallery by Sofitel, a collection of high-end hotels that uses a different scent for each property, conducted a survey of 3,000 guests over the summer and found 78% of women and 74% of men generally like scented spaces. There were different levels of acceptance in different countries, however. In the United Kingdom, one-third of men disliked scent. MGallery has advised its U.K. properties to select fragrances that are not too strong, says Agnès Roquefort, senior vice president of luxury brand management. A side benefit for hotels: Just about every brand now sells its scent in candles and other products for home use. Marriott says sales of all its scents, such as a room spritzer to add the lemony, seductive W smell to your own bathroom or bedroom, are up 35% compared with a year earlier. The Carlyle in New York, a Rosewood hotel, sells more than 2,500 bars of its scented soap each year at $6 a bar. The soap grew so popular, Carlyle now uses the scent in the lobby. Scent marketing has been around for several years. Retailers, medical facilities and entertainment venues routinely mix scent with heating and air-conditioning air flow, or deliver it more directly through strategically placed diffusers or candles. Realtors and developers use scent to sell homes and condos. Airlines including Delta and United are using scent in airport lounges and even on airplanes during takeoff and landing. “Hotels want clean, crisp notes. They don’t want it to be a perfumery, but they don’t want it to smell like a tea shop,” says Edward Burke, vice president of customer strategy and communications for ScentAir. Though each brand has a scent, it’s ultimately up to local hotel operators whether to use it. ScentAir says it costs a small hotel about $100 a month to scent a lobby and other public areas. A large hotel might spend $2,000 a month on a scent program, depending on size and desired effects, Mr. Burke says. Hotels say they don’t use scent in individual rooms, but companies like ScentAir are working on technology that could give guests the ability to control scent in their rooms. Some hotels already have installed tablet computers in rooms with controls for TV, temperature, window curtains and lighting. Scent could be added, but the cost to deliver individually controlled fragrance into rooms remains the stumbling block. “That’s one of our main projects. Hotels say they’d love to have that ability if we can do it at the right cost,” says Mr. Burke.